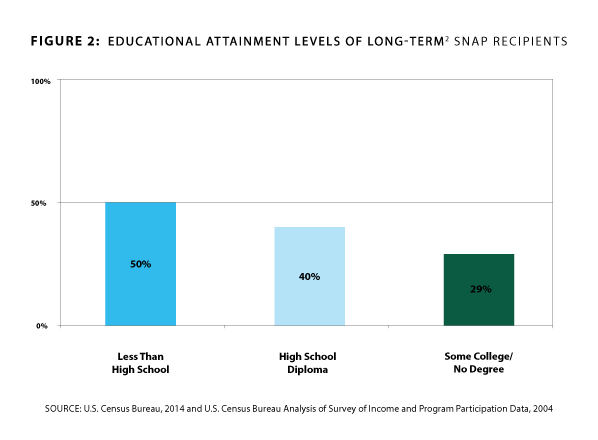 The need of Supplemental Nutrition Assistance Program (SNAP) participants to secure the education and training required to transition to economic self-sufficiency is growing increasingly urgent. 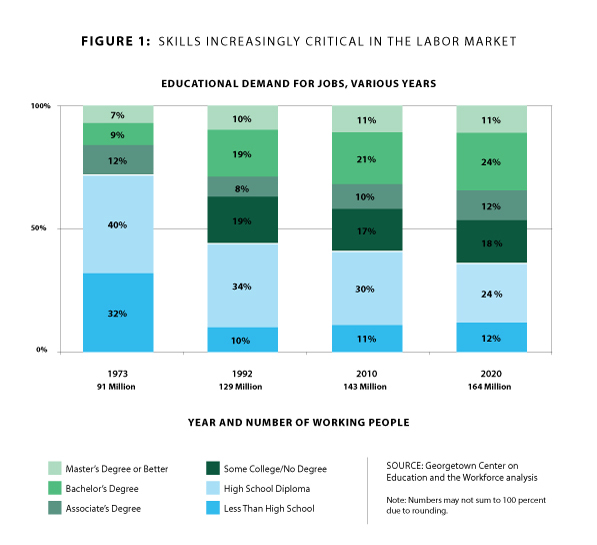 The vast majority of jobs in the future will require at least some education beyond high school (Figure 1), yet many SNAP participants have not reached this level of educational attainment. Without the skills to meet rapidly changing labor market demand, the chances of SNAP participants getting a good job and reducing their need for SNAP are extremely low. In fact, longer-term participants are more likely to have less than a high school diploma as compared to their higher-educated peers (Figure 2). The SNAP Employment & Training (SNAP E&T) program, a skills and job training program for SNAP participants administered by the U.S. Department of Agriculture's Food and Nutrition Service (FNS), is a key resource States and their partners can utilize to help SNAP participants meet this urgent need for skills and better jobs. SNAP E&T has historically been under-utilized, but a renewed focus on the program amid greater urgency for job training for SNAP participants has created new momentum for states seeking to build bigger, better, and stronger E&T programs. There is no more opportune, or critical, time for states to build robust, job-driven SNAP E&T programs. “Job-driven” means that programs are responsive to employer demand so that they place ready-to-work participants in good, available jobs or provide skills training and credentials participants require to obtain these jobs. SNAP E&T is increasingly recognized as a critical part of each state’s skilled workforce strategy. USDA and other policy makers herald SNAP E&T as an important part of the national conversation about the need to invest in building a skilled workforce while addressing the nation’s growing economic inequality.